This lovely dramatic bush with its tri-colored array of heavenly-scented flowers has been a wonderful addition to our front yard since year 2003. It was first grown in a container and later transplanted on the ground when we noticed that it’ll be an impressive bush for the landscape with its spreading open branches of dense foliage and beautiful flowers! And true to form, it had been delighting us with its fabulous blooms year in and year out! And I’ve noticed that the more I groom it, the more cheerful it becomes. It seems thankful for keeping it neat and tidy, and will reward us with abundant flowers after each set of 2 pruning (first trim after flowering, followed by second trim when it becomes bushy enough to start flowering again). Light: Prefers semi-shade or filtered sunlight, though can tolerate full sun. Moisture: Needing regular water when actively growing, little to moderate the rest of the time. Soil: Grow best in rich and well drained soil in container or ground. Feed once a month when the plant is actively growing. Features: This deciduous and fast growing shrub can easily reach between 6 to 12 feet tall and 6ft. wide. Foliage is dense and semi-evergreen with medium green ovate leaves. 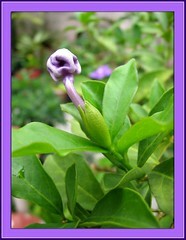 Its tubular flowers, measuring about 1.5 to 2 inches across are sweetly perfumed. Flower colours begin in rich purple on the first day, fading to mauve the next day and then to white on the third day, hence their common names ‘Yesterday-today-tomorrow’ or ‘Kiss me quick’. Due to its flowers changing colours in successive days, it’s delightful to see this bush that blooms year round in the tropics covered with all 3 distinct colours at the same time. However, be aware that this beautiful plant is deadly too as its leaves, flowers, berries and seeds are toxic. 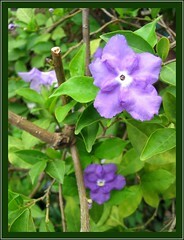 Usage: Brunfelsia calycina bush will be great as a beautiful and fragrant hedge or screen. Excellent as a specimen in home gardens, parks, botanical gardens and conservatories. Also, it is well suited as a lovely stand-alone container plant in patios, decks or porches, as well as can be easily trained as a topiary for decorative purposes. 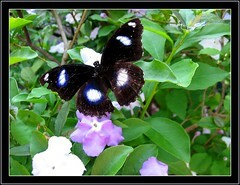 This lovely bush is also most attractive to bees and butterflies alike. Care: Prune after flowering to keep it bushy. Check their leaves underside periodically to control infestation of white flies. For temperate countries: Cold hardiness: USDA Zone 9a-11. Do check this link for additional plant info. 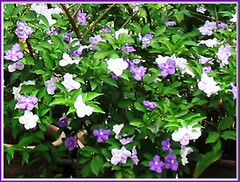 Click here to lead you to an image of the flowering bush of Brunfelsia pauciflora, that was captured on May 23, 2007, after being given a heavy trim earlier! A glorious sight, indeed! 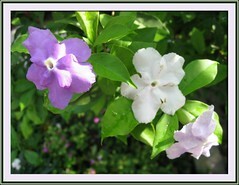 I am looking looking for Brunfelsia calycina / pauciflora (Yesterday-today-tomorrow) bushes. I live in Houston. Can anyone suggest where I might look? 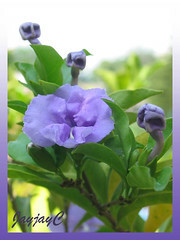 Can i leave my brunfelsia calycina plant outside in winter. I am living in the Netherlands with temperatures up to minus 10 degrees centigrade in winter. Can anybody give me an answer? Thanks in advance.